uAdjust is an adjustable aid strap for quick positioning on the aider and is for body-weight use only. It has two stainless steel buckles for easy adjustability, durability, strength, and extension. The uAdjust aid strap includes a Cheakamus small screwgate carabiner. 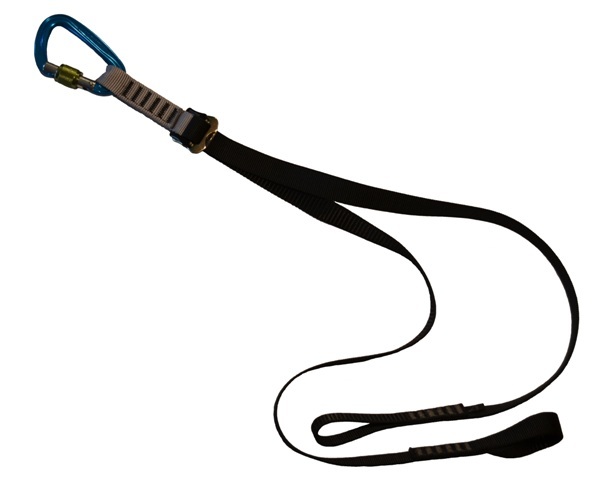 DO NOT use the uAdjust as a climbing lanyard when you are setting belay stations or when rappelling. DO NOT belay off the uAdjust. DO NOT use the uAdjust as a runner or sling. DO NOT use the uAdjust as your sole attachment point. If you do not completely understand the instructions for the uAdjust adjustable aid strap, contact us before you use it.